Please Call: 1-707-488-2181 to make a Reservation or Reserve online With the link below!! A signed Waiver and Release of Liability must be on file for anyone accessing the campground. You are signing for your entire campsite and are responsible for your party and guests. 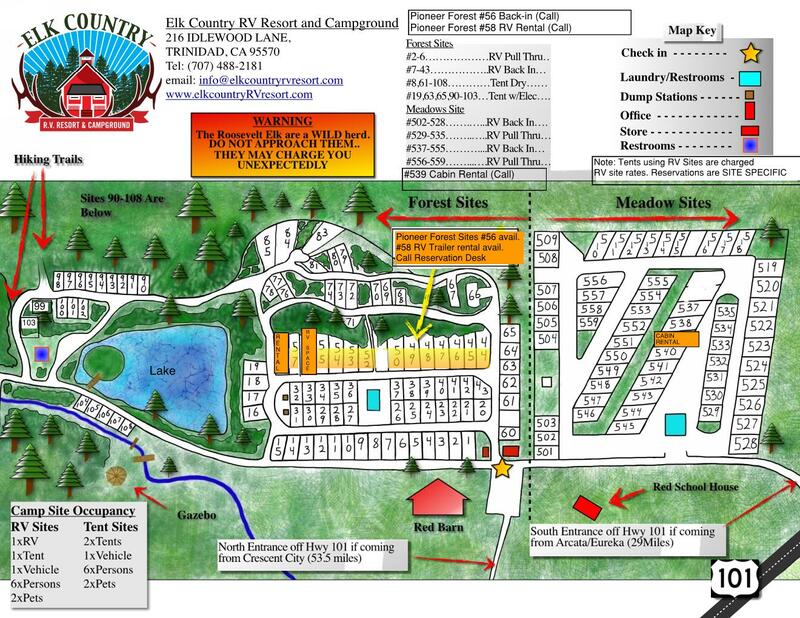 PARKING: Park in your designated campsite, only 1 vehicle per site (RV excepted). All utility trailers and trailers with boats are to be parked in the overflow area with a $5.00 per day fee. Do not block campsites, entrances, streets or park on grass. Do not occupy campsite until paid in full and registration is complete. Maximum stay is 28 days (must be paid in full). If you have not paid or do not move, Elk Country reserves the right to move your unit on the 29th day. Towing and storage fees will be assessed to you. Tent campers may have up to 6 people and 2 tents per campsite. Pop-ups and other canopies are considered a tent. RV’s in full hookup sites may have up to 6 people and 1 tent per campsite. You are allowed 1 vehicle per campsite. Extra vehicles will be charged $5.00 per day each and will be required to park in the parking lot or designated overflow. Each overflow vehicle is required to have a VEHICLE PASS on the front windshield. Unregistered guests must register at the Registration Office PRIOR to visiting a registered guest. Elk Country RV Resort reserves the sole right to restrict or deny access/entrance to the Resort to any person, with or without cause. Unregistered guests are not permitted between the hours of 10:00 PM and 8:00 AM. Keep your campsite CRUMB CLEAN! All food is to be stored in your own containers and all trash placed in the garbage containers before you leave your campsite and before you check out – leave nothing out unattended. Help save our critters! No ATV / UTV (etc.) use allowed. Off road driving not allowed. No firearms allowed, including persons with CCW. No guns, blow-guns, sling-shots, darts, bow and arrow, knife throwing, ax throwing, etc. allowed to be used in any manner in the campground. Illegal drugs (Federal, State and County laws) are not permitted in the Resort or in your campsite at any time. No buying, selling or use included. Pets must be on a leash and under control at all times. Pets must not be left unattended. Pets are not allowed in any public building (restrooms, laundry, etc.). You are responsible for cleaning up after your pet. THIS RULE IS ENFORCED. No aggressive dogs of any kind allowed. Maximum of 2 pets per campsite. No foraging of any kind allowed. Please stay off the face of the dam! Cutting trees or limbs from trees for any reason is not permitted in the Park. Cutting trees or limbs will result in a $500 minimum fine and potential prosecution. Firewood is sold at the Registration Office. No driftwood allowed in the park – if you intend to take with you, place in your vehicle. Do NOT burn driftwood! Fires are allowed only inside designated fire pits or rings in your campsite. Do not leave fires unattended and fully extinguish fires before leaving your campsite. If you bring your own firewood, remove all “extra” firewood, pallets, etc. from your campsite BEFORE YOU LEAVE. Do NOT leave in your site. ECRVR reserves the right to fine you for removal and/or disposal if you leave them there at check-out. Fines of up to double your site fees can be assessed. No burning of driftwood in campground. Children under age 12 must be accompanied by an adult at all times. Children under age 18 must be accompanied by an adult between 10:00 PM and 8:00 AM. No smoking is permitted in any of the buildings or within 25 feet of any entrance. Anyone damaging or defacing the Park facilities will be asked to leave and may be prosecuted. Lights are to be contained within your own campsite, not visible to others. Lighting area outside of your campsite is prohibited. No loud music, no yelling, no fighting, no profanity / cursing. Elk Country RV Resort is not responsible for any damages or loss of personal property. California is in a drought. Please conserve water and use only what you need. Washing vehicles is not permitted. Guests are permitted a maximum of 1 picnic table and 1 fire ring per campsite, PLEASE do not move the fire rings or picnic tables. Walking through or entering campsites not assigned to you is prohibited. All trash is to be disposed of in trash receptacles / trash bins provided. Campsite to be CRUMB CLEAN! Keep our critters (and your stuff) safe. Elk Country RV Resort reserves the right to refuse service to anyone. Management also has the right to remove any person/persons for any reason we deem necessary. By entering Elk Country RV Resort & Campground, you agree that you have accepted the resort rules and acknowledge that you will be held responsible for following them. The Roosevelt Elk are a WILD herd DO NOT APPROACH OR GET CLOSE…THEY MAY CHARGE YOU UNEXPECTEDLY. NOTICE TO GUESTS:This property is privately owned. Guests accept camping privileges with the understanding that Guest(s) release Elk Country RV Resort, its officers, and employees of all liability for loss or damage to property and injury to Guest(s) arising out of the use of Elk Country RV Resort’s facilities, and agree to indemnify Elk Country RV Resort, its officers, and employees against claims resulting from loss or damage to property or injury to Guest(s), or any member of Guest’s family or Guests of registered Guest(s), arising out of the use of Elk Country RV Resort’s facilities.